“Just be careful,” said Colin Hobbs. From: ‘Cleary, Independent,’ by Phil Cleary. The early seventies were the halcyon days of the VFA. Sunday football was in its infancy; Channel 0 used to broadcast the game of the day; the competition cultivated personalities such as Freddie Cook, ‘Frosty’ Miller, Bob Johnson and Harold Martin. Big crowds, big betting, plentiful fisticuffs and ample blood-letting were the order of the day. And Rod Cobain was one of its stars. He was just a nipper when he began his regular winter Saturday routine; venturing along to watch South Melbourne in action. His grandfather had played a game or two with St.Kilda earlier in the century, but his dad was a passionate Swan and decked the young bloke out in a Red and White guernsey, with the number 32 of his favourite player – Ken Boyd. Rod began with Preston Scouts, home club of the legendary Ronald Dale Barassi. With three of his mates – Barry Padley, John Benison and Paul O’Brien, he attended Lakeside High School. They all moved on to Fitzroy Thirds, and were later to play VFL footy together with the Lions. He was rewarded with his first League game in 1966. Named on the bench, against Collingwood at Victoria Park, he got his opportunity after half-time, and sidled down to the forward pocket, to be confronted by the gargantuan figure of the Pies’ resting ruckman, Ray Gabelich. ‘Gabbo’s’ greeting was hardly conciliatory: “Have a look at what they’ve brought on here,” he sniggered to his side-kick, full back Peter Rosenbrock. “Thankfully, our coach Billy Stephen shifted me to centre half-forward shortly after, and I felt a bit more at ease,” Rod says. 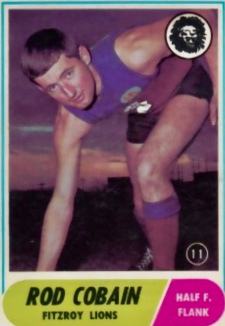 Stephen, who had led Yarrawonga to the 1959 O&M flag during his seven years with the Pigeons, was ‘Coey’s’ coach for the entirety of his VFL career. Later that year, the Lions’ bade adieu to their spiritual home – Brunswick Street Oval. In another promising display – and against the odds – 20 year-old Cobain picked up 17 possessions and five marks in an 84-point walloping by St Kilda. “It was an emotional day for the fans, for sure. But the issue that dominated post-match discussion was the report of Big Carl Ditterich for ‘snotting’ our mid-fielder Daryl Peoples. It kept Carl out of St.Kilda’s premiership side a few weeks later,” Rod recalls. At 6’0” and 13 stone, he reckons he was best suited to the centre, or ruck-roving, but the Lions had a dearth of talent and he was used in most positions. They finished last, 11th, 11th and 10th in his three and a bit seasons, and sampled success on just five occasions in his 27 games. 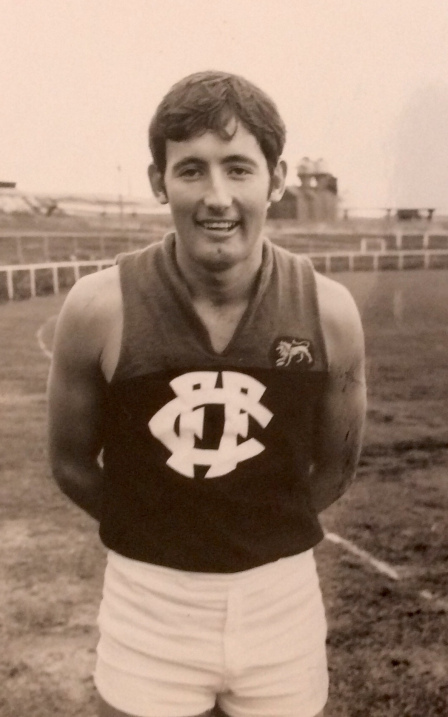 But the memory of playing on such icons as Barassi, Whitten, Baldock, Denis Marshall and Sergio Silvagni as a slight youngster in his first couple of VFL seasons, ranks among his fondest footy memories. When Cobain and Fitzroy parted company mid-way through 1969, he was recruited to Box Hill and produced some blinding form. In the eight games remaining, he finished third in the VFA’s Second Division Field Trophy. 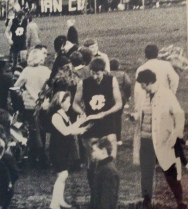 He had been one of their guns in a 44 game, 3-year stint, but Box Hill plunged into deep financial trouble and were confronted with with a mass player walk-out. Preston, the neighbourhood club of his boyhood days, snapped up he and his old Fitzroy team-mate Garry Smith. There was a fair lift in standard between the Second and First Divisions, but Rod fitted in comfortably with the Bullants. Rod had played 58 games with Preston, and was entrenched as a teacher at Box Hill Tech, when he gave consideration to a couple of job offers. One was at Sunshine Tech; the other came from Wangaratta – and sounded appealing. Unbeknowns to him, Keith Bradbury, the local MLA – and a Magpie supporter – was doing a bit behind the scenes to facilitate a transfer to Wangaratta. In the blink of an eye he’d been transferred to Wang Tech School and accepted the role as assistant-coach of the ‘Pies. Wangaratta had been there or thereabouts for the previous four years, without posing a serious threat to the dominant Rovers. But, with a new coach, Phil Nolan, a Morris Medal-winning centreman in Jack O’Halloran, and an emerging group, they overcame all obstacles to march into the 1976 Grand Final. There to meet them were the Hawks, who had battled through a bruising finals series, and still remained an ominous foe. Wangaratta took charge of the game early, and at half-time led by four goals. The huge crowd settled down in anticipation of another spirited Rovers comeback. But this time it didn’t eventuate. The Pies cruised to the line, winning by 37 points. For Rod Cobain, it was his maiden flag; a memorable moment in a fine career. He had barely finished celebrating when Yarrawonga came knocking. They were searching for a replacement for their retiring leader, Bill Sammon, and were adamant that ‘Coey’ was their man. The prospect of coaching sounded attractive, and he admired their approach. “From the moment I took the job on, the Yarra people were terrific,” he recalls. Rod returned to Wangaratta in 1979, and limped through the season. His 33 year-old body was ‘shot’, and he decided to hang up his boots. He embarked on the next chapter of his football journey when 3NE approached he and Peter McCudden to call the O&M’s Game of the Day, in the early eighties. Both TAFE teachers, and well-versed in the nuances of footy, they became the voice of the local game for 15 years or so. Their coverage was often jovial, sometimes opinionated, mostly spot-on, and easy on the ear. Additionally, they ran a Thursday evening program with Mike Walsh. Besides announcing the teams for Saturday’s games, interviews were conducted with many of footy’s biggest names, including Sheedy, Kekovich, Whitten, ‘Crackers’ Keenan, Parkin and a host of local personalities. When 3NE controversially pulled the plug on football, the ‘Cuddles and Coey Show’ was shelved. Rod drifted away from footy. But his enthusiasm was re-ignited a few years ago, when his son Ryan began to make his way through the Bushrangers, and into the Rovers senior side. He and wife Jenny agree that the silky-smooth left-footer is clearly enjoying his best season, despite the obstacles of settling into a new job, and travelling home from Melbourne each Saturday.